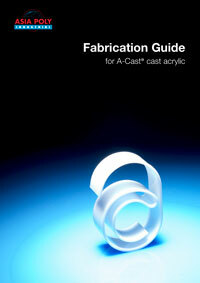 Why choose A-Cast cast acrylic? Asia Poly’s brand of A-Cast® cast acrylic sheet is manufactured from 100% Virgin Methyl Methacrylate monomer (MMA) sourced exclusively from reputable and reliable suppliers. As the premier manufacturer of cast acrylic sheet in Malaysia, Asia Poly utilise the cell-cast production process, maximising the mechanical properties and chemical resistance of the A-Cast® sheet for use in a wide range of applications. With a state-of-the-art manufacturing facility, A-Cast® is produced in small batch quantities which in turn offers the flexibility to produce an extensive range of colours, finishes and effects with colour matching service also available. How can I use A-Cast? A-Cast® cast acrylic is a product that has become synonymous with clarity, colours and choice. The fabrication behaviour of the material and wide range of colours, surfaces and finishes enable designers and fabricators to quickly realise their creative ideas. Detailed information on different processing methods and tools including advice on machine feeds and speeds. © A-Cast is a trademark of Asia Poly Industrial Sdn Bhd. All Rights Reserved. Fresh paint, therefore if you notice something unusual kindly fill out our contact form here.